All fertilizers are not the same! (For this discussion, the words fertilizer and nutrients are interchangeable.) Nutritional elements are divided into two categories; macro-nutrients, and micro-nutrients. Plants need large amounts of some elements (the macro-nutrients) and only trace amounts of others (micro-nutrients). Take a close look and you'll find some of the major brands are not what they're cracked up to be when it comes to growing orchids. All fertilizers contain three main elements; Nitrogen(N), Phosphorus(P), and Potash(K). This is called the NPK ratio. Fertilizer packages always have three numbers on the front panel that describes the NPK ratio. The first number is Nitrogen (N), the second is Phosphorus(P), and the third is Potash(K).The numbers describe what percentage of each element is in the fertlizer. This fertilizer has an NPK of 7-9-5. 7% Nitrogen(N), 9% Phosphorus(P), and 5% Potassium(K). The" NPK ratio" is the ratio of the ingredients inside the package. Adjusting the balance of these main ingredients between the growing and blooming cycles is the key to balanced nutrition. Urea is an inexpensive form of nitrogen, the primary ingredient in all fertilizers (the first number on the package). Orchids cannot use urea until it is broken down by enzymes or bacteria. That's great for outside plants, but sterilized potting mixes don't contain the enzymes needed to convert urea into something the plant can use. Unused urea turns to salt and actually becomes harmful to the plant's root system. This is especially true for orchids because orchids simply can't tolerate salt. Avoid plant food that has "urea" on the label! You might actually be harming your plants! The best source of nitrogen for all potted plants (orchids or houseplants) is Ammonia cal or Nitrate. You can find this on the back panel of the package. Checking ingredients - Urea is the Nitrogen source! Plants need 17 elements for healthy growth. Most fertilizers contain the three main elements (the NPK - Nitrogen, Phosphorus, and Potash). But are the rest of the elements there? If your fertilizer doesn't have all the elements you're taking a hit-or-miss approach and your plants could be missing important minerals. Look on the back of the package and see what's in your fertilizer. 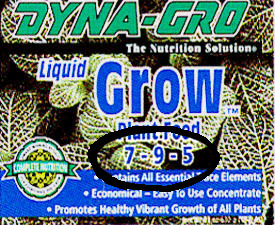 This is Dyna-Gro - a complete and balanced approach to nutrition. See the difference? How Can Nutrients with Lower Numbers Work Better? It all has to do with the purity of the chemicals, not the amount. Many nutrients are made from low grade minerals which are much cheaper (1/4 the price!). Low grade minerals contain filler elements that your plants cannot use - not good for orchids. In nature, orchids cling to rocks and trees. Their roots are designed to quickly absorb anything that comes their way. The roots act like a sponge but are sensitive to harsh chemicals. Their nutrient supply is pure and doesn't contain cheap chemical fillers. Why jeapordize your plant's health with cheap fertilizer that's mostly filler? Organic means "the nutrient contained in the product is derived solely from the remains of once living organism". This includes animal wastes, crop residues, compost and numerous other byproducts of living organisms. Organic fertilizers sound good but most are incomplete in their nutritional value. They contain only one or two nutritional elements so blending different products is necessary. The result is uncontrollable, difficult to measure, and usually carries an odor. You never really know what your plants are getting. Earthworm castings, seaweed, and bat guano head the list of organic remedies. Do you really want to put this stuff on your plants, and in your home? Why take a chance when complete, balanced nutrition is so easy? at a local garden center. It's cow manure(!). Look closer, it's recommended for houseplants? Cow manure in your living room? I grew up on a farm and my relatives would get a good laugh at this one!